According to Gartner, predictive maintenance can lead to substantial savings—in some cases up to a 40 percent reduction in costs. For example, one manufacturer optimized its production plant—eliminating the need to purchase additional machinery for a new customer contract—resulting in a savings of €6M. But analytics requires a huge amount of information. While there’s no lack of data in industrial operations, collecting, normalizing, integrating, and analyzing this data is a huge challenge. Then again, it’s as much about process as it is about technology. Success depends on identifying operational pain points, financial losses, and other challenges. Clear objectives must be defined and agreed on to determine use cases that lead to the most bang for the buck and the best ROI. When a client in the aeronautics sector experienced extended outages, it turned to Capgemini. Machine spindle issues were causing downtime, and replacing the spindle did not resolve the situation. It took two months of trial and error to discover an electrical problem was the source. The operations team took action to prevent future spindle incidents and improve the performance and availability of other equipment as well. To do so, the company deployed the Capgemini Predictive Asset Maintenance with Edge Compute solution. The solution has enabled the company to reduce maintenance costs and improve worker productivity. The system alerts users about machine problems and when a failure may actually occur—be it in two weeks, two months, or two years. This means saving money by maintaining equipment when the time is right—not before it’s needed and not too late. With customized analytics and near real-time interaction between the application, management, and field service personnel, deviations from steady-state operations can be detected. And finely tuned settings prevent false alerts through built-in machine learning, which continuously evolves the solution to improve performance and asset life. “Predicting and anticipating that a machine will break down is the ultimate step of preventive maintenance. We utilize methods based on statistical models using the history of machine status, maintenance operation, breakdown characteristics, and other factors,” said Ravix. Deploying predictive asset maintenance enables this aeronautics company to evolve its operations from full preventive maintenance to condition-based maintenance—saving resources, time, and money. To assure success, Capgemini starts each new project with collaborative planning that includes key stakeholders—from equipment operators to plant managers. A successful deployment involves many aspects. It’s far more than data collection, analytics, and reporting. It also depends on getting the right information, at the right moment, to the right people—and the tools and training necessary so the information has value. “You need to have a methodology to manage this kind of digital transform across the organization—from the people on the shop floor to the managers in the office suite,” said Ravix. Factory automation applications such as preventive maintenance are effective only when they make people’s jobs easier. This is a big reason why Capgemini places a big focus on working with those on the factory floor and out in the field. In the end, technicians and operators can provide a higher level of expertise and value because they have access to more accurate and timely information. Connectivity–Collecting machine data via PLCs, sensors, and historian APIs—all of which are stored in a time series database—enables monitoring performance in near real time. Data Flow–First-level predictive maintenance is triggered through machine monitoring and alerts when thresholds are exceeded or during noncompliant operation. Data Platform–The combination of a calculation engine, dedicated database, and machine learning provides advanced monitoring and cognitive supervision. Visualization–Customizable and personalized dashboards for desktops, tablets, or smartphones. Figure 1. 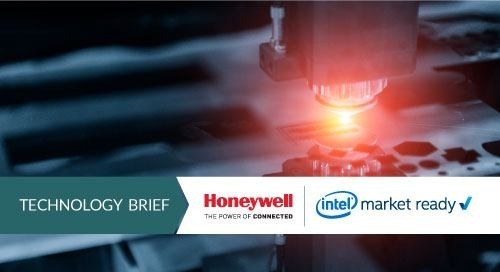 Predictive Asset Maintenance with Edge Compute solution architecture. Machine data is recovered at regular intervals, and analytics are performed locally on the XIoT edge gateway before being sent to the cloud. This reduces bandwidth requirements, and with local storage, data is available for backup in case of network shutdown. The system is continually monitoring this data and uses predictive analytics to create alerts via texts or emails to management and field personnel. Additional cognitive capability can even pinpoint which part of a specific machine is destined to fail and in what time period. Georganne Benesch is the Senior Content Editor and Writer for insight.tech. Before this she was an independent writer, authoring blogs, web content, solution guides, white papers and more. Prior to her freelance career Georganne held product management and marketing positions at companies such as Cisco, Proxim and Netopia. She earned a B.A. at University of California at Santa Cruz.